Mandolin and guitar perform great timeless romantic favorites from Italy and Mexico, expressing the heartfelt yearnings and emotions common to both cultures. ANSELMO (AL) FABRIZIO) as a child would listen with fascination when his dad, born in Italy, would occasionally play Italian melodies on a mandolin made by his grandfather. Those melancholy sounds were deeply embedded in his memory. But it was only later in life, when he wanted to recapture those memories that Al seriously began playing mandolin and embraced the expressive Neapolitan tremolo style made popular in Italy. During that time he met Hugo Wainzinger. Together they played various events and soon built a recording studio in Al’s graphic arts business producing two albums, “Serenata Italiana” and “Italian Heartstrings”. “Bella Serenata” and this fourth CD, ”Serenata D’Amore,” were produced at their new recording studio located in Mountain View, California. The popularity and response to their music ushered Al into a new professional musical career, fulfilling his lifelong hope to share his family’s musical heritage. It is fitting that his niece, Rita Fabrizio, plays flute in three selections in this album. She holds a master’s degree in flute performance from San Jose State University and received her bachelor’s degree in music from San Francisco State University. touch” on guitar captures his audiences who savor every note. He is well known in the San Francisco Bay Area for jazz festivals, various local venues and for his studio work as a sound engineer and producer. Hugo lives in Sunnyvale, CA. and is a partner with Al Fabrizio in Heartstrings Music, LLC., a recording and production studio in Mountain View, California. Everything about it is outstanding...the selections... the mandolin...guitar and the arrangements all transported me to a wonderful place of calm and pleasure. 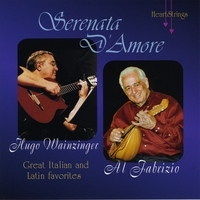 It is a great addition to the three other CDs by Al Fabrizio and Hugo Wainzinger which I play continually. Thank you for this wonderful gift of musical pleasure. Beautiful, timeless, haunting, and romantic ... a musical treasure. Thank you for this wonderful addition to your other CDs!